Passionate about community, Lyle Foster (EdD) is a diversity trainer, university instructor and entrepreneur. A native of the state of Virginia, Lyle learned early in life to appreciate the value of an education. His mother Jacquelin was an educator and encouraged him to take advantage of any opportunities to learn. Following this advice at 16, Lyle went to Macalester College in St. Paul, MN and later to Brown and Yale University for graduate school programs. It was at Macalester that Lyle was a part of the award winning Sounds of Blackness musical group. He completed his doctoral program in the Educational Leadership and Policy Analysis program at the University of Missouri and is currently Assistant Professor at Missouri State University. 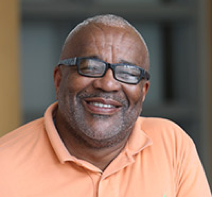 Early in his career, Lyle’s interest in community development led to working in non-profit organizations advocating for the needs of families and children in poverty. During this time Lyle implemented several award winning initiatives for homeless families. Lyle has served on numerous boards and committees and has founded several non-profit organizations. An accredited diversity trainer, Lyle conducts Diversity Workshops and Trainings on issues related to: Implicit and Unconscious Bias, Cultural Consciousness, Diversity and Inclusion in the Educational Environment, Tough Dialogue as a Diversity Tool, Creating an Inclusive Classroom, and Preparing for a Multicultural United States. Lyle is also a Columnist in several local newspapers. On the university level, Lyle teaches undergraduates and graduates in areas including Sociology, Social Problems, Multicultural Education, Poverty, Diversity Training, Counseling and other areas. In 2015 Lyle implemented the Tough Talks initiative at Missouri State to provide conversation threads on issues of diversity and inclusion for students and staff. Community, empowerment and inclusion are some of the main drivers in Lyle’s life. Loving life, loving people and serving community are the mottos that he lives by.